I have been making cards for a long time now but when my grandson became older I thought he would no longer appreciate "Grandma's cards". So I bought him a teenager card with computers mobile phones etc in the design. When he opened it his face told the story. I whispered to my son "What's the matter?". "He was expecting a handmade one" came the answer. I have never made the same mistake again. He is twenty now and he always comes to see me for his card and I do my best not to disappoint. What a lovely story Betty and I am so glad you still send out cards that you have made yourself. They are so personal and I can imagine your grandsons dissapointment not to get his special one from you on his birthday. 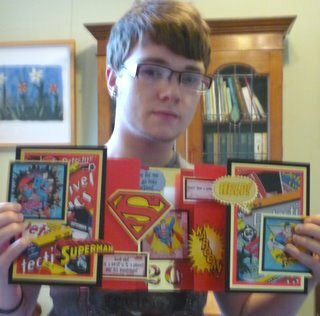 so nice to hear of a grandson appreciating a hand made card. I can imagine how thrilled you were. I sent my baby grandson a bought 1st birthday card, and two weeks after his 9year old sister a handmade one, as she opened it, she looked up and said have you made this Nanna? I said yes, her face lit up and she finished opening it with a 'YES' shouted out. What a rewarding hobby we have. Lovely lovely card he is holding - would love to know how you did that. So nice to make cards or anything handmade for your family and friends. This give you the opportunity to show that you really care for them. I always think about them when I make some (what they like colors,figures, signs, embelishment and that I think gives a special finish to the project I do). Lovely idea the teenage card and happy grandson. Bet you won't disapoint him again.